Item #S168273 - Clear And Ruby Red Crystal Rhinestone Silvertone Vintage Estate Necklace And Post Dangle Drop Earrings Matching Jewelry Set - Parure. Flaw: Some color loss on the red baguette rhinestones in the necklace. Size: Necklace: 15 1/2 ". Clip Earrings - 1 3/4". Glistening clear round crystals filled the 'V' center that has ruby red baguette rhinestones decorating in a symmetrical fashion. The support crystal chain is soft and drappy leading to a foldover clasp closure. Matching post earrings carry the design of the necklace center piece. Stones are pronged in a silvertone finish. This beautiful jewelry set is in excellent condition, all the clear crystals are sparkling, but the red baguette rhinestones in the necklace have loss some color (discounted in price). A fabulous matching Jewelry set to wear at weddings, prom nights, pageants, parties, cruises and special functions! US$98.00. Item #S168227 - Art Deco Style Clear Swarovski Crystal Silvertone Cross Necklace And Dangle Drop Post Earring Matching Jewelry Set - Parure. This necklace and earring matching set is so pretty and sweet that you'll love it regardless of your religious faith. There are 7 crosses in the center portion adorning the front neck base. Each ear has 2 dangling crosses to match. A total of 11 crosses. I read that 11 is a spiritual number, how appropriate! The sparkling clear Swarovski crystals are prong set in a shiny silvertone finish. The post earrings are for pierced ears. Mint condition. A fabulous matching Jewelry set to wear at weddings, prom nights, pageants, parties, cruises and special functions! US$88.00. Item #S168220 - Amber Rhinestone Pink Aurora Borealis Crystal Vintage Antique Leaf Brooch Pin And Clip Earrings Matching Jewelry Set - Parure. 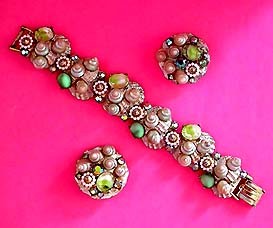 Size: Brooch: Length: 3 1/4". Width: 2 1/4". Earrings: Length: 1 3/4". Width: 7/8". Wow, you need to see this in person in order to appreciate the stunning impact of this spectacular set! The exquisite amber marquises are arranged in layers creating sumptuous depth of opulence. There are breathtaking pink Aurora Borealis crystals sprinkling all over the jeweled leaf throwing off profuse vibrant sparkles! That's not all it, the bottom of the leaf has a large headlight brilliant cut round champaign colored rhinestone surrounded by five pink dazzling crystals to form an exquisite floret. If it wasn't for the fact that this brooch is rivetly constructed (typical of the 40's) and the prongs are not Juliana, you would believe that it is a Juliana set. It sure has all the beauty that Juliana owns. This could be a top of the line unsigned Judy Lee. The spectacular brooch and the equally brilliant matching earrings are certain to make your heart pulsate. Excellent condition. 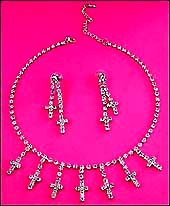 A fabulous matching Jewelry set to wear at weddings, prom nights, pageants, parties, cruises and special functions! US$188.00. 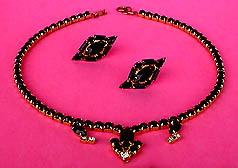 Item #S168243 - Jet Black Glass Clear Rhinestone Goldtone Vintage Estate Antique Necklace and Screw Back Earrings Matching Jewelry Set - Parure. Size: Necklace: 15". Earrings: 1 3/8" x 3/4". Luscious jet black round, marquise and baguette faceted glass stones pronged in bright golden metal making for an obvious regal sophistication. Also glitzy clear pronged rhinestones for sparkles and color contrast. Excellent condition. A fabulous matching Jewelry set to wear at weddings, prom nights, pageants, parties, cruises and special functions! US$128.00. Item #S168187 - Clear Crystal Baquette Silvertone Vintage Necklace, Bangle Bracelet And Post Earrings Matching Jewelry Set - Parure. 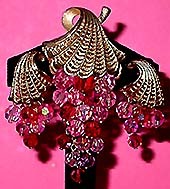 Item #S168182 - Ruby Red Fushia Crystal Grape Cluster Goldtone Vintage Brooch Pin And Clip Earrings Matching Jewelry Set - Parure. Flaw: Tiny bit of gold chipped off on the brooch. Not noticeable at all unless looking very close. Size: Brooch: Length 3 1/2", Width 1 3/4" at the widest point. Earrings - 1 3/4" x 1" at the widest point. A spectacular display of brilliant ruby red and fushia faceted crystal grape clusters sizzling with passion! The articulated fan-like Art Deco goldtone design is beautifully contoured and has lovely panels of texturing tooled out scallops contrasting the smooth high polished edging. There is one in front and one on the back where the sparkling crystals of the brooch are hung, no short of detail here! The largest crystals measure almost 1/2" in diameter! You'll paint the town red literally with these fiery crystals! Excellent condition. 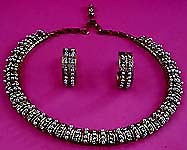 A fabulous matching Jewelry set to wear at weddings, prom nights, pageants, parties, cruises and special functions! US$168.00. Item #S168197 - Vendome Clear Crystal Faux Seed Pearl Vintage Brush Goldtone Necklace And Clip Back Earrings Matching Jewelry Set - Parure. The opulent Vendome necklace is composed of many gorgeous shimmering brush goldtone domed links accented by lustrous white seed pearls and glitzy clear crystals! A link of seed pearls and a link of crystals, one link at a time, link after link, alternating each other. The matching clip earrings are hoop style and have thick edge looking very rich and substantial. This elegant Vendome set will likely allure many lookers. Excellent condition. A fabulous matching Jewelry set to wear at weddings, prom nights, pageants, parties, cruises and special functions! US$168.00. 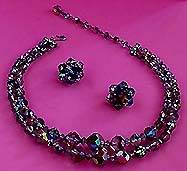 Item #S168183 - Two Strand Aurora Borealis Crystal Vintage Necklace And Clip Earring Matching Jewelry Set - Parure. Size: Necklace: total length 16" including 3 1/2" extender. Earrings: 7/8" x 7/8". Two graduated strands of exquisite crystals emitting intense brilliant rainbow colors! The crystals are heavily faceted. They radiant a rich palette of hues and throw off bright fancy colors reminiscent of a glittering disco ball. The largest crystals are almost 5/8" in diameter. The end bars also have glizty clear rhinestones. The matching crystals of the lovely clip earrings are wired together forming a beautiful floret on the ear. This superb vintage set captures the spirit of nightlife and sets you in the mood for some serious partying! Excellent condition. A fabulous matching Jewelry set to wear at weddings, prom nights, pageants, parties, cruises and special functions! US$148.00. Item #S168139 - Pink Porcelain Rose Vintage Brooch Pin And Clip On Earrings Matching Jewelry Set - Parure. Size: Brooch: Width: 2 1/2". Length: 1 1/8". Clip On Earrings - 7/8" x 7/8". Sweet, adorable pink, white roses and lovely green leaves donating youth, springtime and butterflies! The roses look real and vivid attributing to the fantastic workmanship of an skilled artisan. The pretty matching rose earrings are clipbacks. Absolutely flawless. Excellent Condition. A fabulous matching Jewelry set to wear at weddings, prom nights, pageants, parties, cruises and special functions! US$98.00. Size: Necklace - 16". Bracelet 7". Glittering amber and gold crystal rhinestones prong set in a bright goldtone finish lending for a royal elegant appeal. You'll look like a princess wearing this gorgeous set! Excellent condition. A fabulous matching Jewelry set to wear at weddings, prom nights, pageants, parties, cruises and special functions! US$148.00. 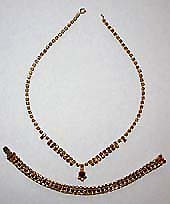 Item #S168250 - Signed Monet Faux Coral And Goldtone Branch Beaded Vintage Estate Necklaces And Pierced Earrings Matching Jewelry Set - Parure. Size: Two Necklaces: 31 1/2" and 16 1/2". Earrings: 1 1/2". Designer: Signed MONET with a copyright symbol. Monet is a high-quality costume jewelry manufacturer founded by Jay and Michael Chernow and began making jewelry in 1929. The mark Monet was first used in 1937. Monet developed the very comfortable "friction ear clip" for non-pierced earrings and the "barrel clutch" for pierced earrings. Signed Monet beautiful designer necklace and earring jewelry set boasts striking colors of shimmering gold branches and lush faux coral glass beads. Note that this set has two separate necklaces (the longer one is 31 1/2" and the shorter one is 16 1/2 " of which you can wear together or separately. Please click to see the enlarged photos. The beads are strung in a sturdy yet flexible goldtone wired chain so that not only are the strands durable, they drape beautifully around the neck. Equally beautiful matching dangle earrings have the Monet's famous 'barrel clutch' backs for pierced ears. The shimmering goldtone branches look like mini gold bars, so pretty! Obviously a high-quality jewelry set. In rare near mint condition. All the pieces are signed. A fabulous matching Jewelry set to wear at weddings, prom nights, pageants, parties, cruises and special functions! US$168.00. Item #S168143 - Pastel Floral Vintage Plastic Stretch Bracelet And Clip On Earrings Matching Jewelry Set - Parure. Size: Stretch bracelet fits any size adult wrist. Clip On Earrings - 1 1/4 " wide. Delightful springtime green leaves and lovely pastel lilies of soft pink, yellow, blue and white dangling flirtatiously around the wrist. The wonderful matching floral clip back earrings are large, showy and draw attention to the face. The lilies and leaves are made in vintage plastic but look very much like glass. Very pretty indeed! Excellent Condition. A fabulous matching Jewelry set to wear at weddings, prom nights, pageants, parties, cruises and special functions! US$148.00. 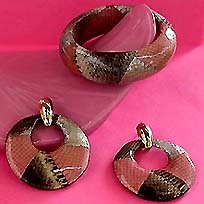 Item #S168136 - Clear Hard Plastic Over Salmon Pink Silver Grey Faux Snake Skin Bangle Bracelet And Dangle Earring Matching Jewelry Set - Parure. Size: Bracelet: 3" inner diameter. Earrings - 3" length x 2 3/8" wide. I love the gorgeous sophisticated color combination of salmon pink, silver and grey of this alluring bangle bracelet and earring jewelry set. The beautiful pieces have a faux snake skin surface giving an exotic wild look. The glossy clear hard plastic and the bold puffy design make them soothingly smooth, shiny and showy. The seductive matching earrings are for pierced ears but can easily be converted to clipbacks. Very pretty indeed! Excellent condition. 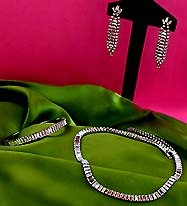 A fabulous matching Jewelry set to wear at weddings, prom nights, pageants, parties, cruises and special functions! US$98.00. SOLD. 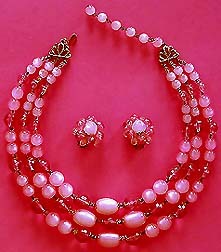 Item #S168126 - Three Strand Pink Glass Lucite Beaded Vintage Necklace And Clip On Earring Matching Jewelry Set - Parure. Size: Necklace: Total length: 16" including 3" extender. Earrings - 1" in diameter. This gorgeous, feminine three-strand vintage necklace and earring jewelry set is done in beautiful luminous pink glass beads, glistening mauve pink lucite round beads and small glitzy clear round glass beads as spacers. The lustrous pink glass beads have a moonstone quality to them. The glittering mauve pink lucite beads look much like sparkling faceted crystals! The lovely matching earrings are clip backs. What a beauty! Excellent condition. A fabulous matching Jewelry set to wear at weddings, prom nights, pageants, parties, cruises and special functions! US$148.00. Item #S168128 - Germany Ruby Red Plastic Beaded Vintage Necklace And Clip On Earring Matching Jewelry Set - Parure. Size: Necklace: Total length: 16 1/2" including 2 1/2" extender. Earrings - 1 1/4" in diameter. Absolutely ravishing! Even though the beautiful ruby red beads are made of old plastic, they have intense fire bursting with fiery from within. You really cannot tell they are not red crystals until you feel them in your hand. The beads are large and gorgeous, they measure 5/8" each in diameter. These amazing beads are strung with a glitzy red small round bead in between them and are faceted to enhance beauty and brilliancy. 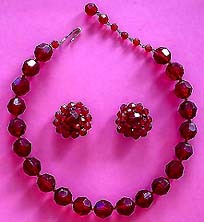 This acutely beautiful Germany necklace and earring vintage jewelry set sparkles passionately like red crystals. What a magnificent fake! Excellent condition. A fabulous matching Jewelry set to wear at weddings, prom nights, pageants, parties, cruises and special functions! US$118.00. Item #S16854 - Art Givre Stone, Faux Pearl, Seashell Goldtone Vintage Link Bracelet And Clip On Earrings Matching Jewelry Set - Parure. Size: Bracelet 7" long and 1 1/8" wide. Clip On Earrings - 1 1/4" in diameter. Designer: Marked ART �. Art Mode Jewelry Creations Inc. produced high quality costume jewelry from the 1940's to late 1960's. This stunning vintage demi-parure is signed "ART". Six links of seashells embellished with glittering Aurora Borealis rhinestones; shimmering green satin cabachons; faceted givre oval crystal rhinestones incorporating clear, milky and green; faux pearl florets and genuine small seashells with a subtle iridesence. The stones are set in goldtone metal textured to look like a seashell and washed with white. All done by hand. A lot of time and labor have putting into creating this beauty. A truly stunning set in excellent condition. Very unique and collectible. A fabulous matching Jewelry set to wear at weddings, prom nights, pageants, parties, cruises and special functions! US$188.00.